Many of you will already be aware of my well broadcast plans to close the Elland workshops and concentrate on design / restoration consultancy work. 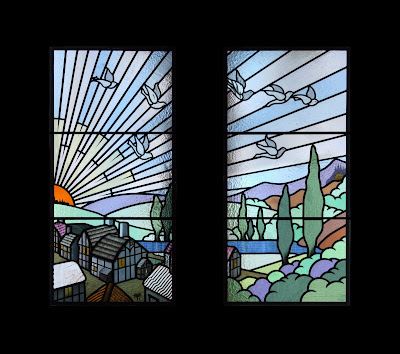 In fact dozens of stained glass companies have said they want to go on the list of specialist nominee / tenderers for my consultancy and out-sourcing work, and I promise I will be in touch with all of you in due course. To all those companies that have expressed an interest in buying items of stock and equipment, I can tell you that (just before our deadline date today!) Design Glass of Wyke have confirmed that they want to buy everything as a `job lot` AND take over the lease and move across from their existing premises as soon as possible. This has all been agreed with the landlord, so the workshops will not be closing after all! I have had a good look at Design Glass and I am impressed with their systems and quality - they are excellent leaded light makers - and we are hopeful that with my design input they will be able to satisfy many of my existing `old` customers with future projects. However I will have no financial stake in Design Glass, and the Paul Lucker Designs business, (including the website) will remain completely independent. This is essential to the role of a consultancy, in which I must be able to recommend suppliers, artists and restoration specialists with no vested interest. Hence my promise to check out all those interested parties mentioned above. This exciting new situation frees me up to do what I love, and offers opportunities to work with other companies and further broaden my horizons. Thanks to all those clients and suppliers who have been so supportive over the years. You have not got rid of me yet! Finally, a big thank you to my last employee, the trusted and very talented Dan Beal (CAMGP) who leaves today. Next month he starts a new role at Lincoln Cathedral, and I wish him all the very best for the future. He deserves it. For this project the client spotted the `Heralding the Dawn` windows on our Royal Hall feature and wanted more of the same in their door panels.